Keep feeling fabulous and fresh even when you’re on the move, and design your own travel makeup bag. Print your designs onto both sides of the thick neoprene zip pouch, which will give all your bottles and compacts extra protection whilst you’re on the go. Whether you’re jet setting somewhere fabulous or simply taking a day trip out of town, be prepared and travel in style. Why limit yourself to just the bare essentials when you travel? Add some style to your luggage and design your own travel cosmetic bags, the perfect way to store your toiletries and cosmetics without having to compromise on space or style. Made from an extra thick 0.12" neoprene, all glass bottles or delicate products will be kept safe with the additional padding whilst you travel. Upload your photos or artwork to our online design studio to create a beautiful and unique travel pouch, with the option to design both sides of the bag. Finish off the piece with your choice black, ivory, pink or blue zip colors to complete your new travel essential. I was absolutely blown away with the quality of the zip top pouch, tray and bone china mug I ordered for gifts. The photos looked so good! The order came faster than a major brand retailer who boasts fast shipping! The items were packaged very well too which was nice to see especially this time of year. I can’t wait until my family opens their Christmas gifts. I will be sure to tell everyone how pleased I am with your company. Thank you!! Great quality and super cute. Received in a very timely matter. It was "new school/I love you" gift for my 14 year old daughter. She loved the pouch to use for school stuff. I recently purchased some new furniture and didn't want to leave any rings on it from cups. I looked around for places that could make custom coasters. Most places had low quality and/or did not allow for different pictures per coaster. As in, a set of 4 all had to be the same picture. These guys allowed for different pictures per coaster. My collection of Deadpool emotions will be printed next as I couldn't be happier with the first batch! Who Will Love This Travel Makeup Bag? Frequent travelers, holiday goers or commuters who like to freshen up en route. These travel cosmetic bags are incredibly versatile and aren’t just for makeup. 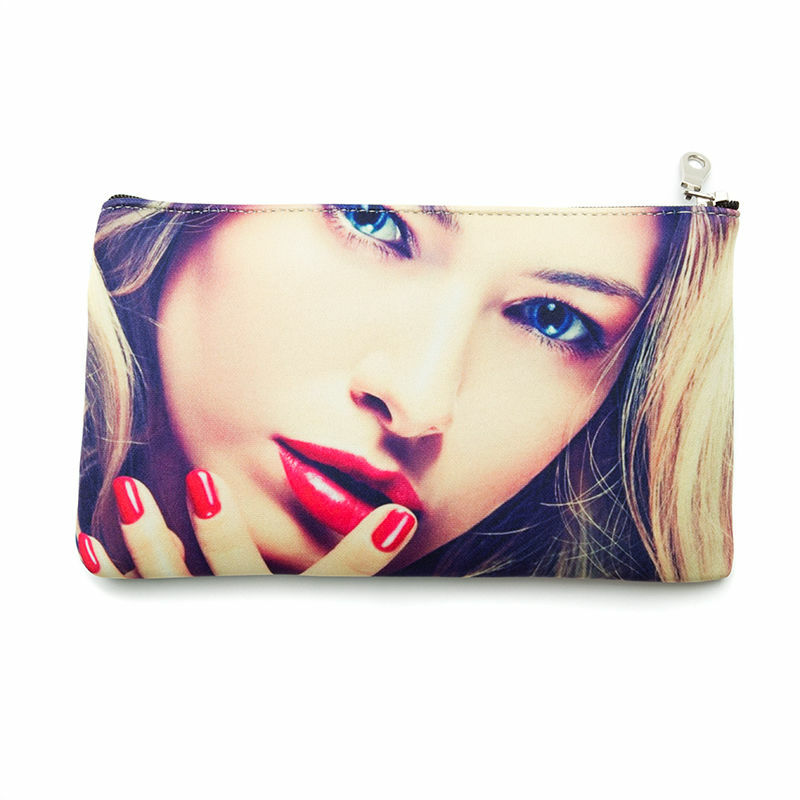 As well as makeup and toiletries, you can use it as a valuables pouch for festivals or whilst camping. It even makes an excellent craft pouch, keeping all the small necessities such as needles, threads and pins, safely together in one space. The neoprene material will also stock any stray needles from poking out through the sides of the pouch. Our 0.12" thick neoprene fabric has a delicate sheen to it, which beautifully lifts the colors of your print and makes them look that extra bit more vibrant. The flexible nature of the fabric means they’re ideal for storing makeup of all sorts of shapes and sizes inside, and means it can easily fit in amongst your other luggage. Choose either different or the same images or collages to print on each side of the pouch, for an added dash of creativity. Using sublimation dying, your prints are reproduced onto the material to the highest quality, and won’t fade or scratch over time. Expect a stunning print with a consistent tone all over. Keep inspired on your travels and adorn your travel makeup bag with beautiful images of places you’d love to visit. You can even create a photo collage in our online design studio, and experiment with adding text for the names of locations on your dream travel list. Alternatively, why not design it for a friend who you love to travel with? Cover both sides in photos of the two of you together; it’s sure to bring a smile to anyone’s face. Choose a zip color that will make your designs pop, and ties in the color palette nicely.